Military-run Pakistan Aeronautical Complex (PAC) at Kamra has launched manufacturing of Android tablets, Android eBook readers and Windows/Linux notebook computers. All three products are being offered by Commercial Products Manufacturing Cell (CPMC), a join venture of Pakistan Aeronautical Complex Kamra (PAC) and Hong Kong-based INNAVTEK. Initial prices range from Rs. 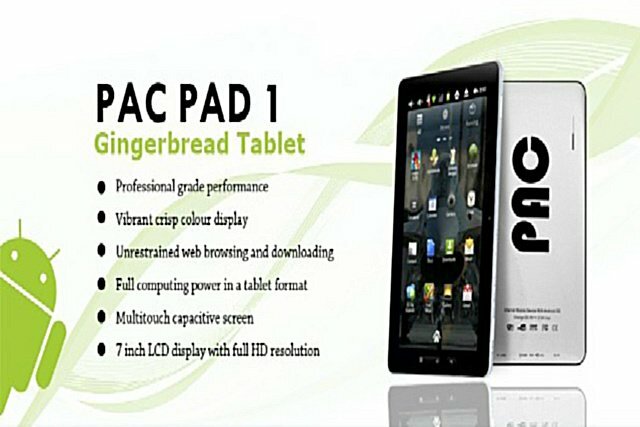 8,000 for PAC eBook reader tablet, to Rs. 15,000 for PAC PAD 1 tablet computer and Rs. 23,500 for PAC nBook notebook. PAC PAD is the first to be manufactured in Pakistan, but not the first tablet offered for sale in Pakistan. Last year, PTCL also launched an Android based thin 7 inch tablet computer with EVO 3G and WiFi connectivity built-in. 3G EVO Tab is a 7 inch touch screen tablet with built-in EVO service to offer wireless broadband internet on the go in more than 100 cities and towns across Pakistan. Powered by Google Android Froyo 2.2 Operating system, 3G EVO Tab offers support for both 3G and Wi-Fi for an un-interrupted on-the-go connectivity. 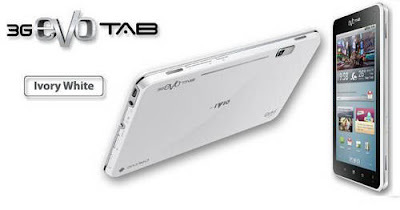 With a 5 MegaPixel Camera, a variety of built-in applications, 3G EVO Tab lets users browse, snap, share, communicate, navigate, play games and do a lot more on-the go, thereby making it an ideal connectivity solution for users looking for high speed on-the-go 3G connectivity on an Android platform. PTCL 3G EVO Tab offers convenience and speed with three diverse economy packages to suit individual needs and pockets. Its 12-month bundle offer has been very successful with majority sales in this bracket.Customers can get EVO Tab for as low as Rs 7,999 plus 12-month unlimited EVO service, all at Rs 31,999. In addition to the 12-month contract, EVO Tab offers bundled packages based on 3 and 6 month contracts at Rs 27,999 and Rs 29,999, respectively with 3 and 6 month of unlimited EVO service. History tells us that the Chinese People's Liberation Army (PLA) has played a huge role in China's phenomenal industrial progress and its emergence as the factory of the world in the last few decades. Even in the free-market capitalist system of the United States, great inventions like semiconductor chips, computers the Internet have their origins in the defense establishment. The US military has played a key role in funding research, development and manufacturing industries to support America's military-industrial complex and its space program. In spite of some of the well-deserved criticisms of the the world's biggest military-industrial and space complex in America, no one can deny that a lot of innovation, jobs growth and economic expansion has flowed from it to benefit the American society at large. The latest PAC-Kamra venture is a good example of how military projects can help spawn commercial industries in Pakistan, essentially replicating the American and the Chinese industrial experience. With experience and economies of scale, PAC computer products are likely to follow the traditional cost curve of electronics products and become more powerful and affordable for larger numbers of Pakistani customers. Growing domestic market for computers should also attract private investment in the sector and stimulate the national economy by creating more skilled jobs, and help boost human development and productivity. PAC computer products have the potential to enable huge opportunities for education, communication, business and entertainment. Take distance learning as an example. The quickest and the most cost-effective way to broaden access to education at all levels is through online schools, colleges and universities. Sitting at home in Pakistan, self-motivated learners can watch classroom lectures at world's top universities including UC Berkeley, MIT and Stanford. More Pakistanis can pursue advanced degrees by enrolling and attending the country's Virtual University that offers instructions to thousands of enrolled students via its website, video streaming and Youtube and television channels. PAC products can be expected to contribute to the ongoing information revolution in Pakistan by making information and education more accessible to a larger cross-section of Pakistani society. Such a revolution is essential for Pakistan to rapidly move into the 21st century, and reap full demographic dividend of its youthful population which is naturally attracted to modern gadgetry of computing and communications. I applaud Pakistan's military for taking a page from the Chinese PLA playbook. As the only robust and well-functioning institution of Pakistani state, the military should do whatever is necessary to strengthen the nation's industry, economy, human capital and national security, regardless of any critics, including Ayesha Siddiqa Agha and her myriad fans. This is the best way forward to a well-educated, industrialized, prosperous and democratic Pakistan in the future. Shahbaz Sharif, Chief Minister Punjab, today launched the free laptop scheme in Punjab, under which 110,000 free laptops will be given away to bright students in the province. During a launch ceremony at Punjab University Lahore, Mr. Sharif announced that giveaway of 110,000 laptops will be start from February 2nd, 2012 in Rahim Yar Khan and will run district wise to complete the delivery in whole province by end of March. He mentioned that Punjab Government spent Rs. 4 billion for 110,000 free laptops, while another 300,000 laptops are likely to be approved for free giveaway next year. Chief Minister also unveiled his plans for providing free internet connection at home for students, however, he said that procedures are being worked out to achieve the project. He announced that whole of Punjab University and its campuses will be equipped with WiFi for free and portable internet access. It is likely that other government universities will be converted into such hotspots as well. On the occasion, he unveiled Dell Laptops that are supposed to be given away in the scheme. Black skinned laptops are going to be for boys while red colored laptops for the girls. It appears that Laptops given away to students are Dell Inspiron N5050. Inside a high-security air force complex that builds jet fighters and weapons systems, Pakistan's military is working on the latest addition to its sprawling commercial empire: a homegrown version of the iPad. It's a venture that bundles together Pakistani engineering and Chinese hardware, and shines a light on the military's controversial foothold in the consumer market. Supporters say it will boost the economy as well as a troubled nation's self-esteem. It all comes together at an air force base in Kamra in northern Pakistan, where avionics engineers — when they're not working on defense projects — assemble the PACPAD 1. "The original is the iPad, the copy is the PACPAD," said Mohammad Imran, who stocks the product at his small computer and cell phone shop in a mall in Rawalpindi, a city not far from Kamra and the home of the Pakistani army. The device runs on Android 2.3, an operating system made by Google and given away for free. At around $200, it's less than half the price of Apple or Samsung devices and cheaper than other low-end Chinese tablets on the market, with the bonus of a local, one-year guarantee. The PAC in the name stands for the Pakistan Aeronautical Complex, where it is made. 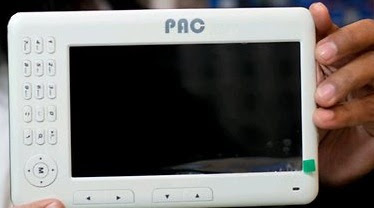 The PAC also makes an e-reader and small laptop. Such endeavors are still at the pilot stage and represent just a sliver of the military's business portfolio, which encompasses massive land holdings, flour and sugar mills, hotels, travel agents, even a brand of breakfast cereal. PAC officials suggested the program that produces the PACPAD was modeled in part on the Chinese military's entry into commercial industry, which lasted two decades until it was ordered to cut back lest it become corrupted and lose sight of its core mission. The tablet and other devices are made in a low-slung facility, daubed in camouflage paint, near, a factory that produces J-17 Thunder fighter jets with Chinese help. "It's about using spare capacity. There are 24 hours in a day, do we waste them or use them to make something?" said Sohail Kalim, PAC's sales director. "The profits go to the welfare of the people here. There are lots of auditors. They don't let us do any hanky-panky here." PAC builds the PACPAD with a company called Innavtek in a Hong Kong-registered partnership that also builds high-tech parts for the warplanes. Maqsood Arshad, a retired air force officer who is one of the directors, couldn't say how much money had been invested, how many units the venture hoped to sell and what the profit from each sale was likely to be. The market for low-cost Android tablets is expanding quickly around the world, with factories in China filling most of the demand. Last year, an Indian company produced the "Aakash" tablet, priced at $50, and sold largely to schoolchildren and students. Arshad said a second-generation PACPAD would be launched in the next three months, able to connect to the Internet via cellphone networks and other improved features. He said the Kamra facility could produce up to 1,000 devices a day. During a brief test, The tablet with its 7-inch screen appeared to run well and the screen responsiveness was sharp. "It seems good, but operationwise I have to look into it," said Mohammad Akmal, who had come to the store in Rawalpindi to check the product out. "Within a month or so, we will know." India's highly touted $35 tablet, set to ship in two to three weeks, is getting a makeover with improved hardware and Google's Android 4.0 OS, according to the company assembling the device for the Indian government. The second-generation Aakash 2 will have a 7-inch capacitive multitouch screen and a faster single-core, 800MHz ARM Cortex-A8 processor, said Suneet Singh Tuli, CEO of Datawind. The new $35 tablet will ship with Android 2.3, but will be upgradeable to Android 4.0 about six to eight weeks after delivery, Tuli said. "The product development is complete and deliveries are expected to start for Aakash 2 in about two or three weeks," Tuli said in an email. The tablet's total price is around $45, and the Indian government will subsidize that to $35, Tuli said. The Indian government has budgeted for the acquisition of about 5 million units for the country's fiscal year, which started on April 1, and the tablet will be further upgraded as component prices come down, Tuli said. The original $35 tablet was announced in July 2010 by the Indian government as a subsidized low-cost computing device for students in the country. Shipments started late last year but have been affected by disputes between Datawind and an Indian education institution responsible for providing specifications and testing the tablet. The Aakash 2 is a significant upgrade over the original $35 tablet, Aakash, which means sky in Hindi. The original tablet had a 7-inch resistive touchscreen, Android 2.2 and a slower 366MHz processor based on an older ARM architecture. The Aakash 2 will have 256MB of RAM and 2GB flash storage, which are the same as the original $35 tablet. The tablet will likely be upgraded to dual-core ARM Cortex-A9 processors by the end of the year, Tuli said. Many tablets today use Cortex-A9 processors, including models from Samsung, Asus, Acer and Lenovo. "We're confident that by the fall, Cortex A9 dual-core processors will be in the same [price] range as what Cortex A8 is at today," Tuli said. The development and deployment of the original Aakash tablet has been marred by controversies. The Indian government was expected to buy 8 million to 10 million units of the original Aakash tablet by March 31 this year, which was the end of the Indian fiscal year. But shipments have been much lower than expected mostly due to disagreements between Datawind and Indian Institute of Technology-Rajasthan, which was responsible for providing specifications and field testing for the device. The differences between Datawind and IIT-Rajasthan related to testing criteria used to see if the tablet met certain requirements, Tuli said. The original Aakash device was tested on parameters such as shock, water resistance, temperature and dust and humidity, according to a document sent by Tuli describing test results. IIT-Rajasthan has now been removed from the project, and the Aakash project has been transferred to the Indian Institute of Technology-Bombay, Tuli said. IIT-Bombay will also be the first buyer of Aakash 2 and purchase about 100,000 units. IIT-Bombay, in Mumbai, and IIT-Rajasthan, in Jodhpur, are among the top science and engineering educational institutions in India. IIT-Rajasthan did not immediately respond to a request for comment. Huawei, a leading player in telecommunication is all set to launch 5 touch screen Android mobile phones in Pakistani market on July 16 in Lahore. The models are expected to be Ascend P1, U8860 Honor, U8850 Vision, Ascend G300, Ascend Y200. Huawei has long been present in Pakistan providing network solutions to cellular operators. Although it has floated lower price handsets as a part of bundle offers in association with the leading cellular operators in Pakistan but this is the first official launch of Huawei’s smartphones in the local market. We cannot rule out the possibility of making available these smartphones as a bundle offer through cellular operators as being one of the largest network equipment provider in the world Huawei already has strong ties with the cellular operators. Ascend P1 is the finest among all 5 having 7.7 mm thin body, Quad-band GSM and penta-band 3G with HSPA support, 4.3″ 16M-color capacitive Super AMOLED touchscreen, latest stable flavor Android OS v4.0 Ice Cream Sandwich, Dual-core 1.5GHz processor, 1GB of RAM, 8 MP autofocus camera with LED flash, Standard 3.5 mm audio jack; Dolby Mobile 3.0+, SNS integration and everything else that what Android offers. A little lower in price is U8860 Honor that is 11 mm in total and offers TFT capacitive touchscreen of 4.0 inches and 480 x 854 pixels of display, 1 GB storage, 512 MB RAM, 4 GB ROM, Qualcomm 1.4 GHz Scorpion, Android OS, v2.3 (Gingerbread), 8 MP, 3264×2448 pixels, autofocus, LED flash, SNS integration and much more. With Huawei joining the scene, it will be a good sign for the local market where Samsung leads the smartphone category (thanks to Galaxy series) followed by HTC offering a wide range of smartphones. As Nokia no more considered to be a challenge soon in the future and particularly after the fall of MegaGate, Q Mobile appears to be a third contender for a pie in the local Android market which is getting charged up with low priced Android based mobilephones. Market analysts believe that Huawei with huge funds and better R&D will be a much better competitor for Samsung and HTC. It may knock out QMobile in the first round provided the distribution and sales network perform as per expectation. Nevertheless, it would be interesting to see how market reacts to this new entrant. We have heard that expected price range of Huawei’ upcoming smartphones is PKR. 9,500 to PKR. 42,000. Suneet Tuli, the 44-year-old CEO of UK/Canadian/Indian startup Datawind, is having a taxing day. “I’m underwater,” he says as he struggles to find a cell signal outside a restaurant in Mumbai. Two days from then, on Sunday Nov. 11, the president of India, Pranab Mukherjee, will have unveiled the seven-inch Aakash 2 tablet computer Tuli’s company is selling to the government for distribution to 100,000 university students and professors. (If things go well, the government plans to order as many as 5.86 million.) In the meantime, Tuli is deluged with calls from reporters, and every day his company receives thousands of new orders for the commercial version of the Aakash 2. Already, he’s facing a backlog of four million unfulfilled pre-orders. We’re speaking over the same overtaxed cellular networks that he hopes will enable Datawind to educate every schoolchild in India through the world’s cheapest functional tablet computer. But it’s a losing battle, as his connection to one of the 13 separate cell carriers in Mumbai buckles under too much competing traffic. He has to repeat himself when he tells me the ultimate price university students will pay for his tablet, after half its cost has been subsidized by the Indian government. In India, that’s a quarter the cost of competing tablets with identical specifications. Similar tablets in China, the world champion in low-cost components and manufacturing, go for $45 and up, wholesale. Which means the Aakash 2 isn’t just the cheapest fully functional tablet PC on the planet because the Indian government has decided it should be—it’s the cheapest, period. In the developing world, and especially in India, a country where one billion people have a monthly income less than $200, every rupee matters. Aakash means “blue sky” in Hindi, and that’s a fair description of Datawind’s goals for the tablet. Ultimately, says Tuli, the government would like to distribute one to each of India’s 220 million students. India has 900 million cell phone subscriptions, but in a country where smartphones are rare, 95% of Indians have no computing device. Which means the Aakash, or something like it, could become the sole computer for hundreds of millions of people in India, not to mention elsewhere in the developing world. Doubts have arisen whether India’s tech-showpiece Aakash 2, the world's cheapest tablet, was actually made in China? Union Minister Kapil Sibal had tom-tommed the achievement which was meant to help students who cannot afford expensivePCs or Laptops. Documents reviewed by the Hindustan Times show DataWind founders and NRI brothers Suneet and Raja Singh Tuli may have procured these devices off-the-shelf from manufacturers in China for $42 ( Rs. 2,263 then), exactly the price at which they sold these to the Indian government. DataWind bought more than 10,000 or more "A 13" made-in-China tablets from at least four manufacturers in Shenzhen and Hong Kong between October 26 and November 7. These were shipped to India duty-free as they were meant for school students under an HRD ministry programme. Last year, Canada-based DataWind won a bid to supply 100,000 low-cost computing devices to students. Aakash 2, which is meant to be India-made, is part of that agreement. DataWind had no role either in the design or manufacturing of Aakash 2 tablets, a source said. Documents with HT show that DataWind bought the tablets from at least four manufacturers, Dasen International Electronics, Shenzhen Shitong Zhaoli Technology, Kalong Technology and Trend Grace Ltd.
DataWind's manufacturing partner in Hyderabad --- VMC Systems---had not built any device over the last couple of months, said a source. Its manufacturing partners and facilities in Delhi and Amritsar, respectively, too, had not produced even a single tablet over the last couple of months, the source said. “Instead of manufacturing these low-cost tablets themselves… DataWind has simply purchased these 'off-the-shelf' from China and supplied it to the Indian government,” the source told HT. Technology (IIT), Bombay for testing. IIT-B's role is limited to testing and installing apps. These, it emerges, were subsequently unveiled as Aakash 2 on November 11. ..Dubbed the Aakash 2, the $25 computer was said to be the result of a project originally intended to bring Internet technology to some of the world’s poorest communities. In front of television cameras, a bright-eyed Mr. Ban held up the computer together with India’s U.N. Ambassador Hardeep Singh Puri and Sureep Tuli, the CEO of Datawind, which claims to have manufactured the device. “We need to do more to help all the children and young people make the most of the opportunities provided by information and communications technology,” he said. However, the Indian press insists the computer is a sham. Other than the name of the computer and the box it comes in, nothing else is of Indian origin, according to press reports from New Delhi. The Hindustan Times reported that the computer is made in China, where it is known as the A-13 and sells in shops in Hong Kong and Shenzhen for $42. Shenzhen is the unofficial capital for most of China’s computer manufacturing. The $25 price the India’s U.N. mission proudly hyped resulted from a $17 government subsidy paid to school districts throughout India. On its website, Datawind sells the computers for $80 a piece — a price that places the Aakash 2 in the middle range of similar products already on the market, according to Amazon.com. Mr. Singh Puri, India’s U.N. ambassador, explained it was his idea to hold the news conference after he saw the computer during a brief visit to New Delhi earlier this year. “I saw the Aakash 2 when I was in New Delhi and thought it would be appropriate to bring it to New York during the month when I was Security Council president,” he said, referring to India’s current role as presiding officer at the 15-member council. Mr. Singh Puri, visibly upset, accused reporters of trying to embarrass India’s diplomatic mission with critical articles that appeared only days before he introduced the computer at the United Nations. “We used parts from many countries around the world, including China, but who doesn’t? In the future more parts will be made in India,” he said. Indian reporters could not find that any of the computer’s parts made in India. Lloyd Trufelman, a spokesman for Datawind, insisted that his company would “be eager” to provide computers for independent examination but has not said that would happen. Ironically, cheaper Chinese computers with greater capabilities have been on sale in the United States for several months. One company, Iview, made its cyberpad available to American consumers online this month for only $59 — without government subsidies. 2013 will see the adoption of Cloud services continue to grow in Pakistan. Increasingly, customers – both individuals and companies – will seek to store their data ‘in the Cloud’ as opposed to physical data servers, as well as avail of software services on a ‘rental’ basis. Large MNCs, banks and other financial services companies have already moved into this domain some time ago. Looking forward, educational institutions are likely to take the next step, as digitisation of educational content takes place. Some progressive institutions have already adopted softwares such as Moodle and Learning Management Systems and incorporated their curriculum on them, thereby preparing their scholars for a digital future. Pakistan has over 100 million cellular subscribers; reportedly, around 10% of these use smart phones. Data usage has grown substantially, and there are an estimated 10 million mobile data users in Pakistan. However, it is important to note that 3G has been overhyped and may actually fall short of expectations, as it has in India. Almost a year into its launch in India, only 2% of subscribers have opted for 3G services. 3G will require ubiquitous coverage for consumers to be satisfied with the services. WiMAX can play an important role here by offering a solution for data backhauling for telecom operators. Wateen has already deployed around 250 WiFi hotspots in Karachi, Lahore and Islamabad, and is ideally positioned to fulfill the data needs for mobile operators. Branchless banking and m-commerce services will be the biggest innovations for the year. New entrants (Zong and Askari Bank, and Mobilink and Waseela) have recently launched their offerings and promise to improve the take-up of this service. New payment solutions will also be a first in the country, as smart phones enable swipe magnetic card readers and pioneering companies such as Inov8 Ltd begin to deliver on their potential for the consumer market. Smart phone apps will also be big. In Pakistan, some companies have already started bringing Android-based devices for as low as Rs5,000. Indians have recently announced that they will be developing the world’s cheapest tablet for $35. These devices will play an exceptional role in transforming societies. The consumerisation of IT has already started taking place in Pakistan. Companies like QMobile will play an important role in the proliferation of low-cost handheld devices. This, in turn, will impact the use of mobile internet and broadband, open WiFi and WiMAX, as well as Cloud services, as consumers look to access data and media on their handheld devices. LAHORE: Acer, a Taiwanese multinational hardware and electronics corporation have re-launched their presence in Pakistan, with a special focus on youth and government functionaries to capture the emerging information technology market. In September 2012, The Express Tribune reported that the government planned to spend Rs4.6 billion on IT projects during the fiscal year 2012-13 with an emphasis on strengthening e-government, human resources and infrastructure development. Keeping the investment in mind, Acer is thinking of capitalising on it. Moreover, this will also aid masses in acquisition of Acer products, besides generating employment opportunities, Mortazavi said. “We will launch more tablets in 2013, at affordable prices, catering the needs of the region,” Mortazavi said. 50% of Pakistan’s population is under 30 years of age and their appetite for information is big, therefore Acer seeks to tap this market segment. The business model, which Acer is adopting for Pakistan is quite interesting. The representatives failed to answer the initial investment figures Acer made for the re-launch. The tech firm wanted to be transparent, growing step-by-step and proceeding to the next goal only after the first one matures. The company’s Islamabad office will, firstly, focus on commercial business and work for importing latest technology. Later, Acer will revamp its entire channel programme and then run a campaign to build a brand image. “We are not in a position to tell the exact figures of the initial investment,” said Ali Nemati, General Manager of Acer for the Middle East, the person previously supervising Acer’s Pakistani operations from Dubai. “Once we achieve the first step of the business plan, in three months, then I will be able to tell the figures,” he said. Acer claims that they still have a 30% market share in Pakistan, despite of their absence, but the officials said that the share is not the goal for them; it is just an indicator of growth for the brand. Acer’s partners and distributors look forward to increased support from the global firm, particularly in terms of customised training, certification, and sales lead generation. “Our partners will be able to see immediate benefits as we focus on making the channel more profitable. The Pakistani IT market is constantly evolving and is of significant importance to Acer. We have made great progress in the last few years, and empowering our channel is instrumental for our continued success,” Nemati added. Wednesday, February 13, 2013 - Peshawar—Dell is proud to be doing its part in developing literacy and promoting education in Pakistan. Dell was recently selected to provide the provincial government of Khyber-Pakhtunkhwa (KPK) 25,000 Inspiron3420 computers, the first round of distribution was conducted on Feb 10 at Peshawar University. The initiative is the largest of its kind ever in the province and is designed to help enable students and people of KPK to become productive and contributing members of society and to give back to the province. Shahzad Aslam Khan, Country Manager Dell Pakistan & Afghanistan, said “We look forward to working with KPK as they increase technology access and the learning potential for students. Mobile computing devices have become essential to daily life — at work, at home and increasingly, in academic institutions. Students are leveraging devices of all kinds to access information, collaborate with their peers and teachers, and produce dynamic content inside and outside of the classroom. At Dell, we believe these devices can help support teaching and learning – and have the potential to personalize the learning experience for each student.Dell is delighted to work with KPK in this important program and is committed to providing these devices by meeting aggressive time lines and ensuring highest product quality”. ...This Karachi-based company was set up by Mian Pervez Akhtar of Allied Electronics Industries – an importer, assembler and distributor of LG products in Pakistan – around five years ago. According to our sources, QMobile’s revenues have witnessed a phenomenal boost since then: for the year ended June 30, 2012, its revenues stood at Rs761 million – up by a staggering 85.8% over the previous year. Pakistan Telecommunication Company (PTCL) has launched an enhanced version of its Evo Tab tablet. The 7-inch new tablet is powered by a 1.2 GHz dual-core Snapdragon processor and runs on Android 4.0, Pro Pakistani writes. The tablet connects via EV-DO or Wi-Fi technology and can also create a Wi-Fi hotspot for other devices. The Evo Tab also comes with a 5-megapixel camera and 4 GB of memory which can be expanded with microSD cards up to 32 GB. PTC offers the Evo Tab with three months of unlimited internet at PKR 18,000. If the government is able to strike the right balance between upfront 3G licence fees and the industry’s capacity to invest in infrastructure, Pakistan is looking at potential investment of $5-10 billion over the next five to eight years from the five players already operating in the country. These are the words of Jon Fredrik Baksaas, CEO of the Telenor Group. He also added that his company was looking at a potential investment of anywhere up to $1 billion over the next two to three years in Pakistan, including the upfront 3G licence fees. “Telenor is already in the process of a network swap in Pakistan. We are upgrading our base stations, which will then be ready to receive 3G equipment. We are about 50% done and should be finished by the end of this calendar year,” he said. He believes that the Pakistani market is now mature enough, with enough mobile penetration, for the demand for 3G to be building up to a healthy level. “On paper, there is about 70% mobile penetration in Pakistan, but probably a bit less in reality, since many people have more than one SIM,” he observed. This indicates that there is a lot of pent-up demand, which means better-than-average growth rates in the initial years of 3G, as was the case in Thailand when it finally jumped on the 3G bandwagon. Baksaas was, however, concerned with regular cellular shutdowns in the country, as he felt that this was not a practical or efficient solution and perhaps needed to be better thought out. He insisted that so far growth and penetration in Pakistan has been much better than regional peers like India, because of the way the local industry is structured and regulated. In India, he said, the focus is on intense competition in the cities alone, because of which rural areas are still not covered. In Pakistan, geographical coverage is excellent in comparison. The mobile operators are going to submit their sealed bids on Monday (today) for the next generation spectrum auction that offers 3G and 4G licences simultaneously. Presently there are 6 blocks available with PTA to be auctioned and there are five players in the market. One block is reserved only for the new entrant and no one from the existing telecom company can bid for that but the new entrants can bid for the reserved block and for the other 5 blocks too. Sources in the telecom sector say that the government will not be able to obtain $2 billion that it is aiming and the maximum gains it can get will stand at $1.4 billion with minor up and down. There is 30 MHz available in 2100 MHz band for 3G, 20 MHz available in 1800 band for 4G services and 7.38 MHz available in 850 MHz band for 2G service and the last one is reserved for new entrant. All the players are bound to bid for the first mentioned 2100 MHz band to qualify for the bid of 1800 MHz band that offers 4G services. Sources told The Nation that in 2100 MHz band, a bidder can bid for at least 5 MHz and in 1800 MHz band they can bid for at least 10 MHz. The base price set for the 2100 MHz band is $29.5/MHz and it is $21/MHz for the later. Presently there are 5 companies operating in the market and among them Warid Telecom seems not interested in bidding for the next generation spectrum auction. Most probably the remaining 4 will take part in the auction and all of them might be successful in obtaining licence for the next generation mobile services but only two will be able to get 4th generation licence. The bids submitted today will decide, whether the next stage of auction will be held or the licences will be allotted to the bidders. The sources said that if the number of applicants exceed the number of licences available that technically are 4 then the next round of auction will start on April 23 and the bidders will have to compete to obtain a licence. But the sources said that apparently there is no hope that the number of applicants will exceed so today might be considered the last day of auction and Pakistan Telecom Authority will decide, who to allot a licence for what. The sources said that most probably the licences will be auctioned at the base price and the government might not meet its expectations to earn much from this auction, not at least $2 billion that it was aiming to obtain from it. The major reason is that the licence reserved for the new entrant fall in the category of 2G technology and no company seems interested to buy a 2nd generation licence while others players in the market having 3G or 4G licences. The sources said that government claimed Turk Cell was taking interest for the spectrum reserved for new entrant but there is no evidence yet that it will submit a bid for that. The first stage of Pakistan’s 3G-spectrum sale process on April 14 exceeded projections of the federal government by $100 million, a source in the Ministry of IT told Newsweek on Wednesday. Four of the five Pakistani operators have bid for the new licenses. Warid, the nation’s smallest telco, has decided to opt out. The two biggest operators, Telenor and Mobilink, have stated that they would be able to deploy 3G services to the masses within a few weeks as their core infrastructure is ready for 3G. Telenor has 7,500 cell sites across Pakistan that are 3G-ready, and the firm’s CTO has stated that 4G can be deployed after some minor upgrades. Mobilink has said that it will have 9,000 cell sites by July, with 70 percent of the infrastructure already revamped for 3G. The local mobile market is expecting strong smartphone sales in the weeks proceeding the 3G and 4G auction. Currently the smartphone market accounts for 15 percent of all mobile imports (1.5 to 1.7 million units per month), but it is expected to rise to as much as 40 percent within a year of the auction – that’s 600,000 new smartphones per month. Some smartphone owners in Pakistan are excitedly awaiting the auction and have started posting speed test screenshots on Facebook or Twitter as operators test their networks in limited areas. Pakistan raised $903 million in its first auction for 3G mobile phone networks on Wednesday, as well as $210 million for the more advanced 4G spectrum, with four foreign-owned companies emerging as winners from the long-anticipated bidding process. The South Asian country of 180 million people hopes to use the auction as a way to boost the economy and promote advanced telecoms technology among its 132 million mobile phone users. The four winners of the 3G auction were Russian-owned Mobilink, Chinese-controlled Zong, Norway's Telenor (TEL.OL), and Ufone - a company jointly owned by the Pakistan government and the United Arab Emirates' Etisalat (ETEL.AD). As for the 4G spectrum, the sole winner was Zong, according to the Pakistan Telecommunication Authority (PTA). Warid Telecom Pakistan, another company operating in Pakistan, did not make any bids. Ismail Shah, the PTA head, announced the results to reporters late on Wednesday after the auction, which lasted all day. Pakistan is the only major country in the region that still does not offer 3G services. Its neighbor, war-ravaged Afghanistan, switched to 3G services in 2012. The country's telecoms market was deregulated in 2004 and foreign firms such as Etisalat have invested heavily. But services that use 3G and 4G connections have been out of reach of most Pakistani customers. The government on Monday signed contract with Haier China to procure 100,000 laptops under the Prime Minister’s youth scheme. Plans for setting up a laptop assembly plant in the outskirts of Lahore was also announced to have been approved in principle. The agreement was signed in a ceremony at the Higher Education Commission secretariat in Islamabad accompanied by a meeting at the prime minister house that was chaired by Maryam Nawaz Sharif. Director General, Information Technology HEC Anwar Amjad and Zhang Le, International Projects Manager, Haier Electrical Appliances Corp. Ltd. signed the contract. The prime minister’s scheme aims to distribute 100,000 laptops during 2013-14. The Prime Minister’s Youth Programme chairperson directed Haier Pakistan to establish a laptop assembly plant in Pakistan. The laptops produced in this plant will also carry the label of “Assembled in Pakistan,” she further directed. The plant is expected to produce laptops of the same quality which are being imported. COO Haier Pakistan Khalid Afridi, GM Haier Computers Tristan Wong, and Managing Director PTV Mohammad Malick were present at the meeting. A Chinese delegation expressed its commitment to set up a smartphone manufacturing plant in Pakistan before Finance Minister Ishaq Dar assured the investors of reduced income tax rates as a neatly-folded package of incentives. The delegation said the plant would be set up on a fast-track basis as Pakistan begins to move forward in the telecom sector after acquiring next-generation 3G and 4G services. In response, the government on Friday assured the Chinese mobile manufacturing companies that its upcoming production plants of smart-phones for next-generation services will qualify for reduced income tax rates announced in the new budget as part of incentives to lure foreign investors. Chinese Mobile Companies Association Secretary General Lou Peide, who was the head of the delegation, informed that the group comprises prominent Chinese companies in the smartphone manufacturing sector. He said the delegation is in Pakistan to share Chinese experience and expertise as Pakistan’s domestic market presents a huge opportunity for the manufacturing of smartphones capable of 3G/4G technology. Piede mentioned that with a population of nearly 200 million and a high growth rate of the mobile industry, there is a huge requirement for local manufacturing units in the country. He informed that Chinese companies own almost 80% of the global market and produce smartphones that cost between $22 to $600, highlighting the impact of Chinese companies in the global mobile phone market. The auction of next-generation contributed significantly to the national exchequer and Pakistan earned over $1 billion from the auction of these licences. Two licences of next-generation technology remain unsold. As against the present corporate income tax rate of 33 percent, the Foreign Direct Investment (FDI) in manufacturing, construction and housing will be subject to 20 percent corporate income tax. Assisted by the Minister of State for Science and Technology and other officials, Dar briefed the Chinese investors on the latest economic indicators and performance of the economy during the last year. He also discussed the proposed budget which provides special incentives for foreign investment in Pakistan. Dar said that FDI in the Information Technology sector will enjoy a special corporate tax rate for the next five years if they complete their projects in a three-year time period till June 30, 2017. The finance minister assured the group of investors that their concrete proposal prepared in consultation with the ministry of IT and the Board of Investment (BOI) will be considered seriously to develop local mobile manufacturing units in Pakistan. He further assured the delegation of Chinese investors that the government will provide incentives for local manufacturing of smartphones and other IT related solutions during the next three years. Dar concluded commenting that as Pakistan has an educated and skilled young labour force, the country can and should be used as an export base to the whole region. Haier Pakistan has announced that it will start a mobile phone assembling and production facility in the country by the end of 2015. While talking to More Magazine, Mr. Afridi said,”we will invest some $8 million in 2015 for expanding our mobile phone division and with the expertise of our Chinese friend, Haier will generate employment for more than 800 people in its production facility”. “We are not relying on importing mobile phones from China but our focus is the transfer of technology in the country so that we could manufacture our own product here. We have already started an assembly line for the laptops in Pakistan”, added Afridi. Today, Haier Pakistan assembles some 2000 laptops in Pakistan every month which it mainly produces for Prime Minister Laptop Distribution Scheme. The company plans to enhance the capacity by the end of 2015 when it starts production for the masses. Pakistan is a market of 2.5 million mobile phones that are imported every month. Afridi foresees that with the introduction of Haier mobile phones in the country, the figure will go up by 30% by the end of current year. To a question about the quality of phones, Afridi responded as, “after the entry of Haier mobile phones into the market, non-branded and weak quality phones will be filtered out in the first phase. We are eyeing to position our product with the brands like Huawei and Apple”. Haier Pakistan has announced three categories of handsets including feature phones, mid-level and high-level smartphones. It is yet to be seen the actual performance of the company in a new and different market which is much volatile than home appliances business. However, with the initiatives like Haier, a very positive message for the foreign investors is certainly on the wall. Haier entered Pakistan in February 2001 by jointly establishing a facility with Pakistan-based Panapak Electronic Company to produce Haier air conditioners. Next, the Group opened Haier (Pakistan) Industrial Park in Lahore in April 2001. In 2004, Haier was the first foreign brand home appliance manufacturer in Pakistan to obtain the ISO9001:2000 Certification which confirms the company meets requirements for quality management systems and enhanced customer service. Haier continues to develop the Pakistan home appliance industry. Haeir has 8 industrial complexes, two of which are foreign-one in the United States, and one in Pakistan. Haier does localization in Pakistan: For Pakistani market, Haier especially designed a washer that can hold 15 long gowns at one time, which is suitable for daily life in Pakistan. Last month, an India-based mobile manufacturing company named Ringing Bells announced a series of ultra-low budget, domestically-produced mobile handsets. These new phones included India’s cheapest 4G smartphone at ₹2999 ($44.60) and a 3G model dubbed Freedom 251 priced at a jaw-droppingly low ₹251 ($3.80). The market for budget smartphones in India is massive: though the per capita income is just under $1,600, this year India is projected to overtake the United States in smartphone purchases. Currently, the market is dominated by a few major players: Samsung, Micromax, and Intex. Using manufacturing facilities in China, companies like Micromax and Intex produce hardware replicas of iPhones, Samsung Galaxys, and HTC Ones, trying their best to provide specifications that keep up with the current global standards. These efforts include Micromax’s $34 3G enabled phone and Intex’s HTC-inspired model for just $50. But until now, no one had tried to market a phone for less than $4. What’s it like to use a $4 smartphone? I decided to investigate. From the start, something about the Freedom 251 didn’t seem right: though the expected delivery date is set at June 2016, it was almost impossible to obtain a review unit after the big reveal. I reached out to Ringing Bells’ media relations team to get one and was repeatedly stonewalled. Then, reports surfaced indicating that the review units that were made available weren’t actually Freedom 251s. They were Adcom Ikon 4s, a $61 handset developed by a Delhi based company, and manufactured in Chinese, and Taiwanese units, and currently available in the market. Amidst the confusion, reports of fraud surfaced. India’s Income Tax Department paid the company’s head office —which was shut down earlier this month— a visit. Since their initial announcement, the Ringing Bells’ website has listed all of its phones, including the Freedom 251 as unavailable for immediate sale, and their social media channels are flooded with unhappy customer comments. All their phones have reached pre-order limits according the communication on their website. Customer support is unavailable, and after failing to get in touch with company representatives over phone and email, it is difficult to understand whether Ringing Bells is still a functioning company. The enforcement directorate has ordered an investigation into Ringing Bells possible breach of the Foreign Exchange Management Act. Ringing Bells has admitted to purchasing demo handsets from Adcom and dressing them up as Freedom 251s to give the press an idea of what their eventual product would look like. But there’s no way Ringing Bells could build a phone comparable to the Ikon 4: a breakdown of the phone’s parts reveals it would cost roughly ₹2500 ($37.33) to build. Adcom, along with everyone else, was dumbfounded by Ringing Bells’ logic; the company has threatened to seek damages against Ringing Bells for dragging its company, and brand name, into this mess. Eventually I did get my hands on one of the Adcom Ikon 4s, shabbily repackaged as the Freedom 251. While booting up, it pops up a rather optimistic screen that has the Hindi line ‘your dreams will come true,’ written in English. The inside panel and battery were taped over with Freedom 251 branding, and the Indian flag was printed across the back panel. In the week I used it, the phone held up pretty well, maintaining a solid 3G connection and functioning about as well as I could expect a $60 smartphone to. For tablets, the race to the bottom has just reached a new low with Datawind’s Ubislate 7Ci, an Android tablet that’s on sale now for $38. The Ubislate 7Ci has an interesting history. It started out as a project by India’s government to get cheap tablets into the hands of students, under the name Aakash. After being announced in 2010 with a target price of $35, the finished product arrived a year later with a $45 bill of materials, and DataWind as the manufacturer. But back then, it wasn’t possible to buy the Aakash outside of India, and a comparable tablet from DataWind cost well over $100. It’s taken a couple years, but Datawind has finally managed to reach a sub-$40 price for U.S. consumers. You can buy the Ubislate 7Ci straight from Datawind’s website. Basically, these are the specs we were seeing on smartphones a few years ago, and tablets of this quality were showing up for $100 as early as 2011. You get what you pay for with these devices, and that generally translates to poor viewing angles, weak battery life and so-so performance. The meager 4 GB of storage doesn’t leave much room for apps, though the inclusion of a MicroSD slot is helpful. Even if you don’t find this tablet appealing, the price point alone is impressive. The average tablet today could reach a similar price in a few years, opening up new uses and business models. Magazines or newspapers could bundle their subscription costs into cheap tablet instead of paper. Schools could install a touchscreen on every desk. Touchscreens and Internet connectivity could become much more commonplace in appliances like ovens, washers and dryers and kitchen tables. For those uses, cheap and “good enough” are all that are required, and that’s exactly where Datawind is headed. Suneet Singh Tuli, Datawind’s CEO, told the Washington Post that the company hopes to be producing $20 tablets in a year or two. For now, Datawind is targeting students and users who don’t have an Internet connection. Word is that DataWind will be showing off its $38 tablet at the CES trade show next month, so hopefully we’ll be able to check it out then. The Punjab government has introduced e-learning system at schools. In the first stage eight public schools have been given tablets. Students are reading science through video stories on these tablets. Math, biology, chemistry and physics subjects are available on tablets for classes six till ten. The lectures are available in both Urdu and English. Meanwhile e-learning libraries can also be accessed through the tablets. Teachers claim that this initiative has made learning interactive for children. “Children learn through imagination. For example when you teach them about an atom they have to picture a nucleus and electron. The videos explain the concept to the children,” a teacher said. “Our concepts are clearer now. The videos are interesting,” a student said. Pakistan lags far behind when it comes to children's education. According to a study, 25 million children in Pakistan are out of school.